First we'll change your body. Then we'll change your mind. We teach classic Bikram yoga in a heated studio. The 26-asana series moves fresh, oxygenated blood through each organ and fiber of your body, restoring health and vitality, just as nature intended. Proper weight, muscle tone, vibrant good health, and a sense of well-being automatically follow. To learn more about Bikram yoga, call us or read Frequently Asked Questions on the official Bikram Yoga website. New to Bikram yoga? Check out our tips for beginners. Seasoned Bikram yogi? Try our 30-day Challenge. Shower + changing rooms. Bottled drinking water $1, towel and yoga-mat rentals $1 per session. Our studio has been open since 1996, managed and owned by Christie William for the past 10 years. *For new students or those who have not taken a class in the last 6 months. Come to as many classes as you like for a specified period of time. Offering Bikram Yoga seven days a week, morning, afternoon and night. All Classes are 90 minutes and suitable for beginners and advanced students. Please arrive 15 minutes early, entrance door remains locked when class begins. Same class times every week (except holidays); teachers for current week shown below. Want to change your body? Take our 30-Day Challenge by practicing Bikram yoga for 30 consecutive days. Want to change your life? Try it for 60 or 90 days! Follow dozens of our fearless students who took the challenge before you. Take charge, take the plunge. Ask us how to get started. Everyone who shows up and tries this yoga gets results! Everyone. Bikram yoga is for all ages and all body types. It is designed for beginners and advanced students alike. You do not need any yoga experience; a highly-trained certified instructor will guide you the entire way. No one will judge you and there's no reason to feel self conscious. Most likely everyone will applaud you at the end of class for trying. Every student remembers what it was like as a beginner! Wear light, form-fitting exercise clothing like sport bras, bike shorts or leggings. Avoid sweat pants and long sleeves. Each class lasts 90 minutes and consists of 26 postures. Our yoga room is heated to 105 degrees, so expect to get hot and sweaty. Sweating and stretching are two of nature's best detoxifiers. And you'll burn hundreds of calories in every class! Some beginners feel dizzy or lightheaded, so you can sit down for a short breather. Your heart may beat faster than in other forms of yoga you've tried. Help promote respect for fellow students and help create a peaceful atmosphere at the studio. Read our Yoga Etiquette Points. Upon entering, please remember to sign-in legibly at the front desk before each class. Walk-ins are welcome. No reservation is necessary. Arrive at least 15 minutes before class time. Leave shoes in the designated shoe area. Silence cell phones and leave them in the changing room or cubbies. Keep your body and feet clean before entering the Yoga Room and refrain from wearing perfume, cologne, or strong scent. Bring a positive attitude and an open mind. Wear shoes when going out to the restroom. New students and beginners should set their mats up in the back row. It is beneficial in your early classes to have more experienced students in front of you as examples. Remain silent. Many students use the time before and after class to quietly meditate and center themselves. Students must be in the Yoga Room before class begins. Yoga is a discipline. All students must use a mat and large towel. When setting up your mat be courteous of the students already in the Yoga Room. Be conscientious of another person's view in the mirror. Make every effort to remain in the class the entire 90 minutes. If you must leave, do so quietly. Make eye contact with the teacher, and wait to reenter the Yoga Room until students are between postures. Dispose of gum in a tissue and in the trash can. No gum in Yoga Room. Observe silence after the final savasana. Try to spend at least 2 minutes in Yoga Room after class to allow your body and mind to return to balance, homeostasis. Leave the Yoga Room quietly. Place all Bikram Yoga mats and towels in the marked bins. Please check your belongings when you leave. Lost and found is donated regularly. If you sweat profusely, be responsible and clean up after yourself. Bringing additional towels is advisable, so that you don't leave a trail of sweat. Please keep your showers to less than 5 minutes. Double check to make sure you have all your clothes, mats, etc. Check out what our students have to say. 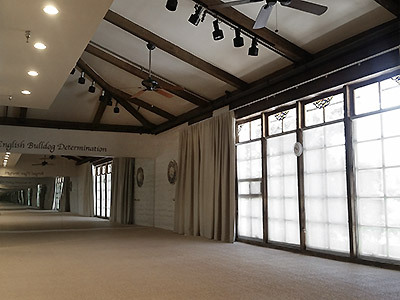 "I've taken Bikram Yoga classes all over the world for the past fifteen years, and the studio run by Christie William in Encino, California, is my absolute favorite. Her space is beautiful, well organized, friendly, and professionally run. She and all her knowledgeable instructors teach with clarity and respect for the various ages and levels of the students in the room; safety is paramount. It's a profound gift for my mind and body each time I take a class there. I'm so grateful for Christie William and the lovely community at Bikram Yoga, Encino." "Bikram Encino is the best Bikram studio. The teachers are highly trained, highly skilled, and carefully chosen. The room itself is beautiful with high ceilings and a view of mature trees. I've practiced Bikram Yoga for 17 years, am trained as a yoga teacher in a different school of yoga, and have attended classes throughout the U.S. and in Canada. Whether you are new to yoga, a casual practitioner, or an advanced yogi seeking spiritual benefits, Bikram Yoga will provide you all you need – physical rejuvenation, mental concentration, and stress relief. I urge any and all to try at least one class, and if inspired, sign up for regular classes or even a 30- or 60-day challenge!" "Bikram yoga boosts my physical, mental, emotional and spiritual vitality. Bikram's combo of cardio and core-strength training continually challenges me to excel. On a deep level, it's taught me to direct my focus away from discomfort, towards accomplishing goals. With every ounce of physical strength I gain, my mental strength blossoms even more. When practicing out of town, teachers often complement my stance and form, due to the Encino studio's emphasis on discipline. They're dedicated to helping students tap their inner strength. In Encino Town Center, upper back. E-mail must be valid; name and message are required.